You know what makes me feel good on a Friday? Art. You know what makes me feel even better on a Friday? Art that comes to me. 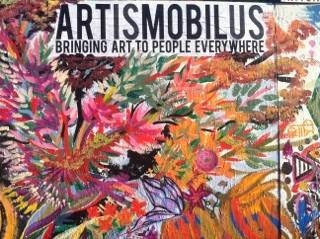 Enter ArtIsMobilUs, "a mobile art gallery and roving arts incubator bringing art to people everywhere while providing platforms for exhibition, arts education, creative collaboration, and community engagement to multiple communities." Translation? It's art on a bus! The mobile gallery was founded by Richard Felix in March of 2012. The bus has two 8'x24' murals on the outside and a walk through gallery on the inside. It's a great way to share the art with people who might not see it otherwise. The bus - soon to be busses - travel throughout the Bay Area at special events and on the following schedule: 1st Thursday of every month at the SF ArtWalk and 1st Friday of every month at Oakland's First Fridays. Keep an eye out for the bus rolling through your neighborhood or get involved by becoming a volunteer. Be sure to like their Facebook page so you'll always know where to find them.